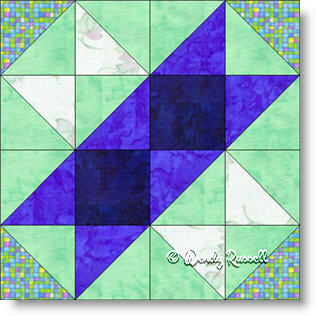 The Road to Vegas quilt block is a four patch block and is a good choice for those who are new to quilting. The block contains only squares and half square triangles, the two most commonly used patches in quilt making. This block has many possibilities, simply because it has a definite direction in the layout of the patches. Then, by rotating several of the blocks, the number of interesting variations to the final quilt is vast. Here I have illustrated two separate settings of the blocks, both with rotations of some of them, thus producing totally different looks. What can you come up with?